One thing many editors agree on is the need to jog and shuttle in the timeline. Jog and shuttle are movements of the cursor along the window (timeline) that shows the sequence of video or sound. This movement, as well as the ability to execute commands easily without looking at their keyboard or moving their mouse is paramount. Jog and shuttle devices with buttons that provide these functions will work with one or two NLEs, but won't auto switch when the application in focus changes, say from Premiere Pro (video editor) to After Effects (special effects program). Color coated keyboards with shortcuts printed on the keys are good for one app, but may be useless if another app doesn't share the same shortcuts. Everyone seems to agree they need less clutter at their editing station or desk and greater productivity. Professional control surfaces may be the solution, but can cost thousands. Many editors don't have the space on their desk, need a portable solution and need something that is cost effective. Large control surfaces may work for those who can afford them or for those who have the space on their desks. Some of these control surfaces may be overkill for someone wanting to do simple things not only like jog and shuttle, but copy, cut, paste, save, mark in and out points, import and export with the touch of one button instead of many at the same time. Spending thousands of dollars probably aren't in the budget for most people, and with more editors working in the field or in a cafe or kitchen table as in the case of prosumers, a device with a small footprint that compliments a laptop or smaller computer is a better fit. Color coated keyboards with shortcuts printed on them work for some applications, but don't have the flexibility to auto switch to another configuration. Again, laptop users don't want this option because it would require some kind of skin to be added to their keyboard. For over ten years, the Contour Design Shuttle products have been the choice for professionals as well as prosumers and even beginners editing their videos and sound. The USB connected ShuttlePRO v2 and ShuttleXpress controllers compliment a mouse and keyboard by adding additional functionality to the computer. Contour Design's software is the key to its simplicity as well as it's power. The ability to execute commands with the touch of one button instead of pressing multiple buttons at once, as well as setting the inner jog wheel and shuttle ring to actions such as scrolling or zooming, gives any program user an advantage. Settings for the most popular editing applications are included, as well as many Internet and office programs such as Microsoft Office, Mozilla Firefox and many others. 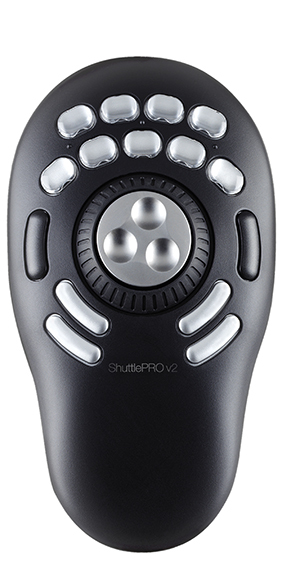 The ShuttlePRO v2 has fifteen programmable buttons as well as an aluminum inner jog dial and spring loaded, rubberized shuttle wheel housed in a sleek, ergonomic design. 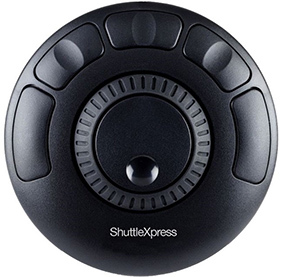 Each button can not only be set to a different keyboard shortcut such as Control-S for Save in Windows or Command-P for Print on a Mac, but the Shuttle software can also create macros that perform many functions with the touch of one button, which is a ShuttlePRO v2 only functoin. For example, a user is editing a video and would like to save the project, switch to a new view, export the video to his hard drive, then upload a copy of the video to his YouTube account. This would require many menu pulldowns with the mouse or presses of the keyboard in a particular order and time. Contour Design's software makes it easy to create one macro to do all of those things, one after another in the order of the user's choosing. 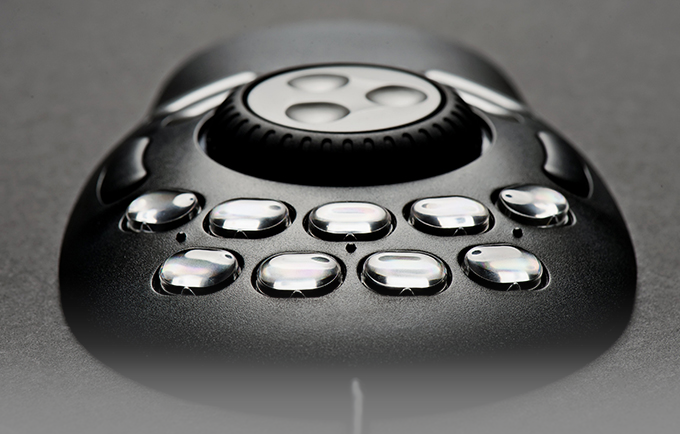 Contour Design's other controller, the ShuttleXpress has most of the same functionality of its bigger sibling the ShuttlePRO v2, but in a compact, five button design. Its smaller footprint makes it perfect for users who just need a jog dial and shuttle wheel and less buttons than the ShuttlePRO v2. Both Shuttle devices are a cost effective and space saving alternative to bulky control surfaces or clumsy multi-colored keyboards.